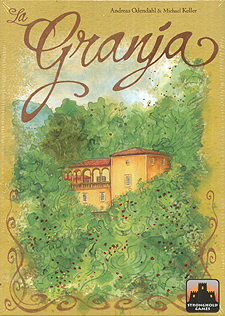 In La Granja 1-4 players control small farms by the pond near the village of Esporles on the island of Majorca. During the course of the game, players develop their farms and deliver their goods to the village as they vie to earn the title of La Granja for their country estate. Timing is critical! Over the course of six game rounds, players will expand their farm by adding fields, farm extensions, market barrows, and helpers. They will earn victory points by delivering goods to the village of Esporles. 1. When a player has fully supplied a craft building, he receives victory points and a craft marker which grants a bonus for the remainder of the game. 2. When a player has fully supplied a market barrow on his farm (i.e. the farm cards at the top of of his farm), he sets up a market stall in the marketplace and receives victory points and a trade commodity. It is important to observe the actions of the other players, to manipulate turn order, and to adjust for the vagaries of the dice and cards during the course of the game.